Thoughts on a book, videos and an Exhibition visit. “…… is not dissimilar to appraising one’s work in relation to genres. It goes well until you come across an anomaly, and the anomaly makes you create a new description and a new category, and it goes well again until the next anomaly and the next category and so on and so forth ….. I can so much identify with that and was also reminded of Exercise 1.2 and the points made by Rosalind Krauss re archaeological examination of the photographic archive and the attempt to dismantle and reassemble it within the categories previously constituted by art and its history. I also watched a BBC One programme episode of the series “Imagine” – “Summer 2018: 1. Tacita Dean: Looking to See”. the documentary was based on Alan Yentob talking with her in her studio in Berlin, visiting her in Los Angeles where she was completing her film “Antigone” and talking with others about her. I learned that her grandfather, Basil Dean, who founded Ealing Studios was interested in colour and location filmography and that he abandoned all his children. Tacita Dean herself is one of three, her childhood was slightly eccentric and isolated. Collecting became a passion for her. 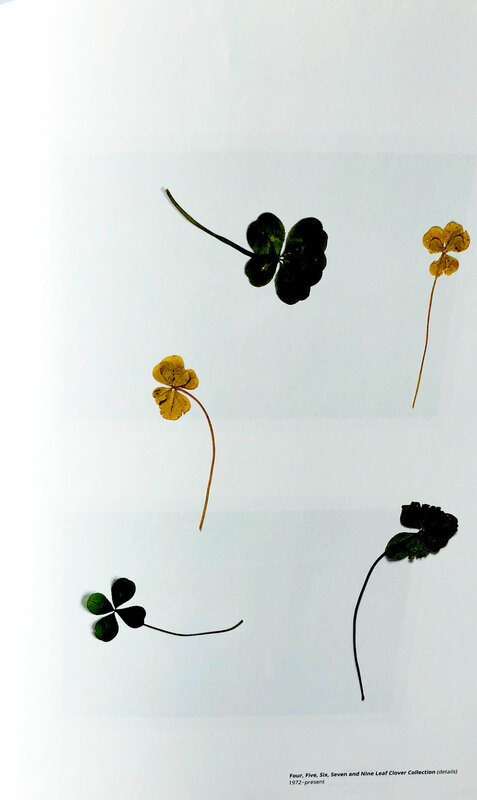 She kept searching for four-leaf clovers as a child and usually finds one now when walking – in a perpetual data of waiting and looking, and also has collections of round rocks, found postcards and photographs. She always wanted to be an artist and refused her father’s wish that she read English at University. Although she grew up in the YBA (Young British Artists) age she was never quite in their gang because her work didn’t quite fit. Tacita Dean is inspired by analogue film and her subject matter is ostensibly modest. An example is Michael Hamburger 2007 – a man in his house talking about apples. Dean lets the camera roll on the subjects who forget she is there. Her work is slow and some critics say it’s boring. Dean talked about what comes when you wait – like a rotating tower you go round and round and come back into the future. What I noticed was her use of frames within frames – as if we are always looking through a window. The documentary itself was fairly slow, leaving spaces between the sentences. I found her quite beguiling – the rhythm and clarity of her voice, with a suggestion that she’s smiling inside; her face movements and her strong physical presence. I was surprised to read in an article in the Guardian (March 2018) that she has suffered from rheumatoid arthritis for the past twenty-five years and walks with some difficulty. In the Tate video below Tacita Dean begins by talking about her film “Green Ray” – the last ray of the sun as it sets and then talks about using film and her response (2011) to the challenge of filling Tate Modern’s Turbine Hall. I’m posting it here as a reference for myself. On an individual level, landscape is biographical: ‘Place’ is to landscape as ‘identity’ is to portraiture. We inhabit this sensory, dynamic medium with our bodies and minds: when we experience or remember landscapes, touch, smell and sound are as important as sight. We also bring to bear pictures, poems and films of landscapes which frame and layer our immediate perceptions. Landscapes are temporarily complex: they work on us with the potent forces of familiarity and strangeness, reality and imagination. The Exhibition took up two large rooms plus the cinema space where her film “Antigone’ was running at hourly intervals. Enormous panels of Blackboard Drawings – made with chalk to create, erase and re-create shadow, shape, form and depth. The sea, clouds mountains, some with writing on them that was hard to read. I noticed the use of sections – often in threes. She seems to enlarge the detail of objects that seem indistinct, such as fluffy clouds. The oak tree Majesty was so large it was also in sections. I’m presuming it is formed from photographs of several trees – hand-printed photographs and then Dean hand-painted around every branch with a small gauge paintbrush using white gouache paint, “delighting in my proximity to even the tiniest and most inaccessible of branches on these mighty trees. There’s a simplicity of approach (I honestly did keep thinking “well I might be able to do that”) combined with creating work on a monumental scale. I think I was somehow identifying with a child-like wonder at the nature of things. A vitrine held some of the large stones from Dean’s Round Stone Collection, which reminded me of the way in which my sons and grandsons collected and filled their trouser pockets with ‘interesting’ pebbles and other small objects whilst we were out walking. In the second room further vitrines hold a part of her four, five, six, seven and nine. I’m not sure she counted properly to be honest, but the arrangement of stems swirling around leaves fascinated me with their delicacy (the BBC One video shows her carefully arranging them using a pair of tweezers) and I wanted to go out and find some to experiment. It made me remember searching for four-leaf clovers when I was small – well, maybe a bit older as well; not to mention the daisy chains. I was intrigued by the film Antigone. The film itself is quite slow-moving, with soft, earthy colours – two frames/screens side-by side, often with one still whilst the other is moving. When I heard Tacita Dean talking about Antigone in the BBC episode I had immediately thought about fathers and children, particularly daughters (bearing in mind what was said about her father and grandfather). I also wondered about the link with her older sister, who is called Antigone, and that the film is a tribute to her, especially given the story of Antigone who was both daughter and sister to Oedipus. Dean writes about this in the book (pp.91) and how she wondered how her father could give his daughter such a name. She once asked him – his answer being that Antigone was the first feminist, “….. an answer that I didn’t expect, especially as it came from the mouth of a man who had penned me a letter whilst I was at art school calling feminism the ‘anorexia nervosa of the West”. It seems that Dean was fascinated by the story of Oedipus from an early stage, beginning at art school. In the film the story of Oedipus and his eventual self-blinding is linked with an eclipse which is a wonderful filmic metaphor that also turned my thoughts towards “The Sublime”. Dean’s description of the making of the film and her own responses really illustrates the creative process and how it can impact upon the creator. As I wrote at the beginning, this is an evolving post as I add further information and reflections. This entry was posted in 3. Tacita Dean and Landscape, August 2018, Research and Reflection on August 13, 2018 by Catherine. I noticed the dried flowers were very like an installation by Edmund Clarke in his In Place of Hate exhibition. Both artists tapping into something about fragility in a remarkably similar way. The clover leaves do look fragile. There is a fragility about her as well somehow – in her voice I think. 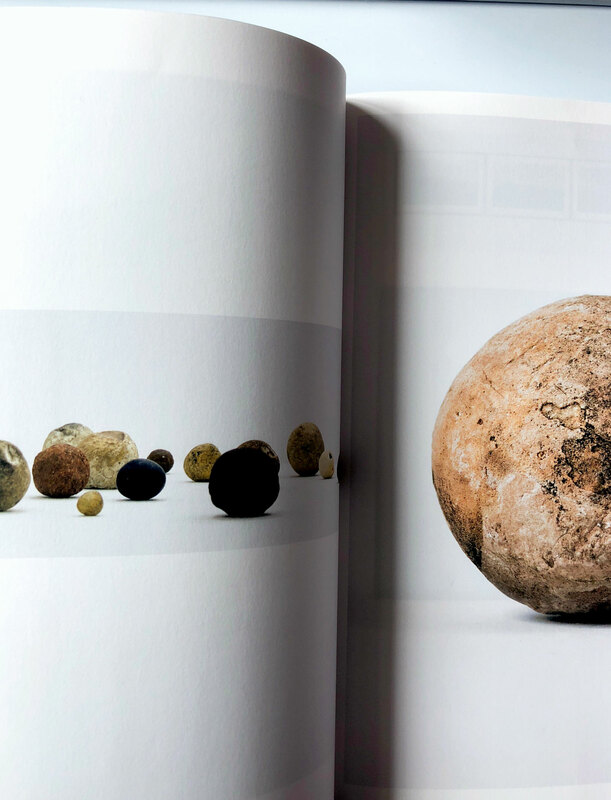 I enjoyed reading this post Catherine…I’ve seen some of Dean’s work but not this exhibition.I would have liked to have seen her oak tree having read an interesting Observer review.And yes the collecting of stones resonated with me too. I collected stones from my local beach as a child and still do occasionally..I see small rocks from Fuerteventura on my bookcase even as I type this! Hi Sue, It’s a shame that photography wasn’t allowed at the RA (which is why I copied a couple of pages in the book). There’s a certain reverence about the way in which the stones and the clover leaves are arranged so it was good to see them in actuality having seen her arranging clover leaves in the video. How are you storing/arranging your own stone collection? I didn’t go to the Portrait part but I did see the Still-Life which didn’t have much impact on me to be honest. I think really allowing oneself to ‘be’ in the landscape is very different from walking through it which is why it is hard to ‘capture’ it in a photograph. Are you able to talk with your dad about what he sees in the landscape, I’m just wondering if there’s any particular landscape that interests him.